I didn't think we would grow a significant portion of our family's food in our little vegetable plot. But I had hoped for a bit more than this. In prior years, we did get repectable (but small) ears of corn. 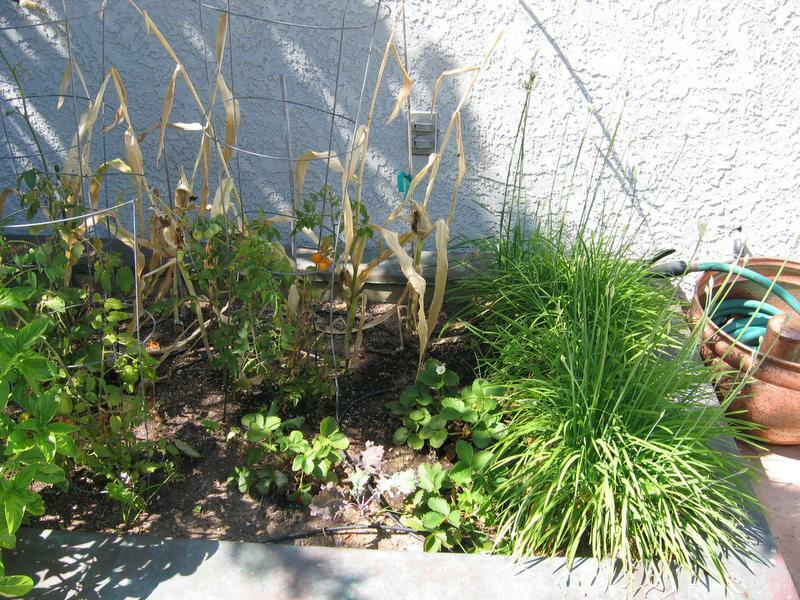 The corn and the tomoatoes grew 6-8 feet tall. When we sat in the dining room and looked out the window, it was like looking through a jungle of tomato vines. 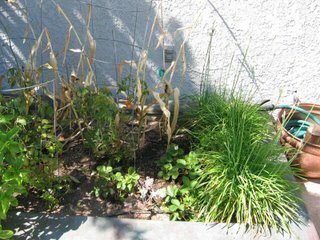 For some inexplicable reason, the corn just withered up and died in July. Funny, it wasn't very warm by the beach during the heat wave. However, I did seed the lettuce a bit later than prudent, in June. The lettuce was too bitter for us to enjoy. The tomatoes never flourished. I couldn't figure out why. Last weekend, I went out to weed and discovered the reason. A little green tomato hornworm. I squished that little guy without remorse. Wikipedia showed me that the little brown moths I had been seeing all summer were the adult versions of those little green worms. That will teach me not to get sick and neglect the garden. I have been cheating on the Basalt Tank. 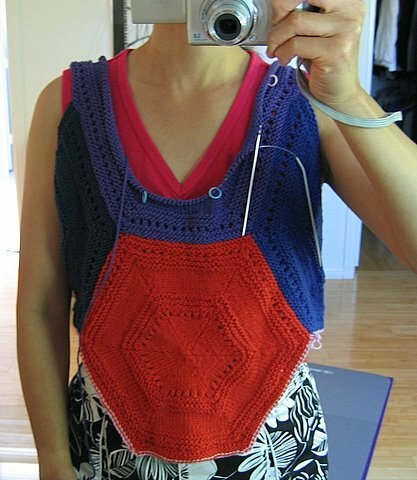 Once I began knitting with Yarnex, I couldn't stop. The play of the colors amused me endlessly. I had to know what it would do next. 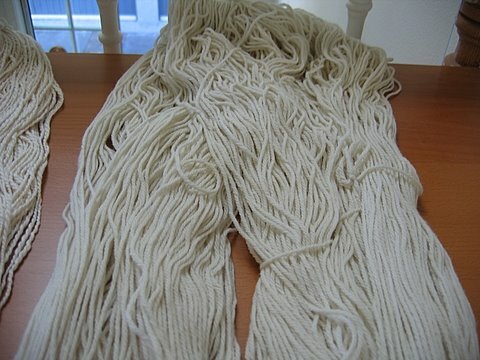 The yarn is so soft. The gauge genie visited me again in the night. After writing that my gauge with the Inca Cotton was 4.75 stitches/inch, I remeasured in the morning. This time, I took the stitches off the needle. 4 stitches/ inch. I put in waist shaping by marking 4 places where I want "darts" to appear. Every 6th row, I decreased at each marker (5 times). 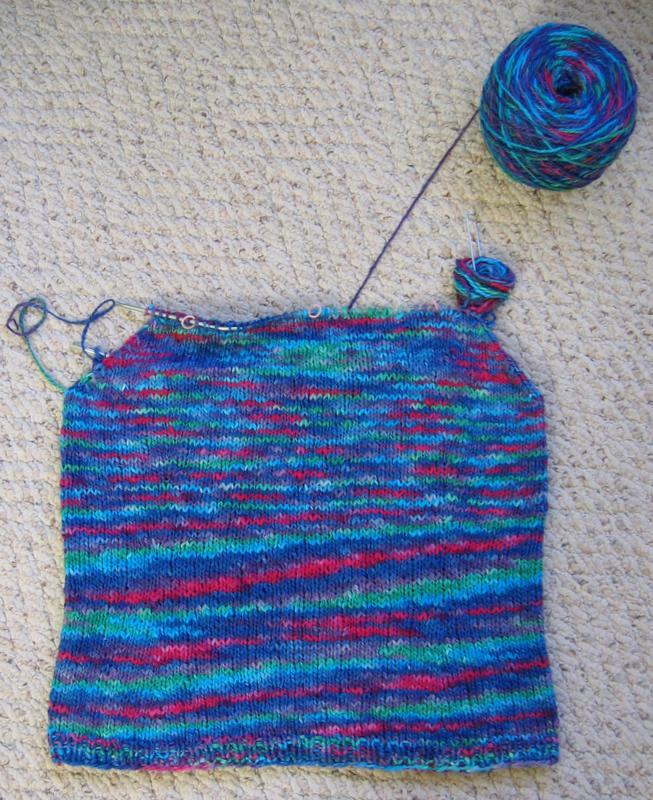 Then I knitted 12 rows even and increased every 6th row at each marker (5 times). You can read more about Yarnex here and here. Here is another picture just to show you that I have made some progress on the Basalt Tank. I am very happy with the neckline. 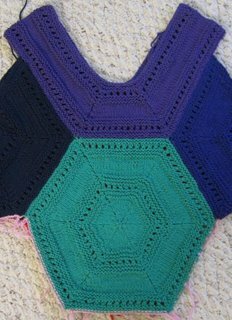 I intend to put partial hexagons on the sides and cast off at about the same point as the shoulder straps. 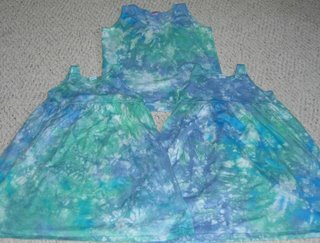 Click on this picture to see a close-up of the neckline and shoulder straps. 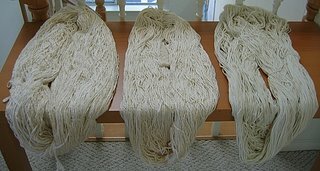 More about yarnex here, here (dyeing) and here (undyed). I don't normally read Forbes, but I had to laugh about the brouhaha raised by Don't Marry Career Women. I didn't read the original piece before it was pulled from the website and the rebuttal went up. Too bad. I like provocative writing. Sociology is not my area of research expertise, but I have a great deal of experience living this research topic. Perhaps the advice should be don't marry career men. I say this slightly tongue in cheek, as career men are more likely to come with nice perks such as health insurance and retirement plans. But, maybe the reason that career women are more likely to divorce is because they are more likely to be married to white collar career men. Arlie Hochschild discovered 20 years ago in her groundbreaking work, The Second Shift, that white collar men are most likely to talk about how much housework they did. But, in time studies where graduate students actually observed the families in their home, white collar men did the least housework. Blue collar men were most likely to report not doing housework-even while they were doing it. The conclusion was that the professional men married to professional wives knew that they were supposed to do housework. Hence they self-reported performing more housework than they actually did. Maybe career women are more likely to divorce their career men because they have the financial independence to kick the bums out. I have been meaning to write about Lariane Zappert's book, Getting It Right: How Working Mothers Successfully Take Up the Challenge of Life, Family, and Career (GIR) for some time. It makes an interesting companion piece to Unbending Gender (UG). GIR is about the experiences of alumnae (female graduates) of the Stanford Business School. UG is about the legal treatment of women's work with a special emphasis on the experiences of women in the legal profession. (I have yet to discover a book about women with PhDs in science dealing with the two-body problem of marriage to a man with a PhD in science.) UG is a great book, though heavy reading. I highly recommend it. I did not find GIR as useful, though it was written to be more accessible for busy people. It was full of concise talking points or "lessons learned" lists. It was a book in powerpoint (and I don't mean that in a good way). Additionally, the coping strategies of the women in the study were way beyond the financial means of most women. The author even notes that most women do not have the same resources as women with MBAs from Stanford. My favorite part was about how marital happiness correlated most strongly with the amount of money spent by the families on outsourcing housework! Enough ink has been spilled about the infamous New York Times piece. A great deal has also been written about Linda Hirschman's much more interesting article about "choice feminism". I didn't really feel like it was worth adding my own two cents about the topic. But I am surprised by others' reactions to Hirshman's article. I think she was right. You might not like her tone, but her facts are straight. As near as I could tell, her points are the result of careful research. They also agree with the findings of others. Hirshman suggested having only one child Hochschild reported that marital satisfaction in her research subjects took a precipitous drop upon the birth of the second child. Hirshman wrote that marrying a man slightly older and slightly more successful was the biggest career killer. Zappert also noted that the majority of her subjects did not work full-time. A slight plurality worked part-time, but more were not doing market work than were working full-time. The ones least likely to work were the ones that married someone only slightly older. One possible explanation is that women who marry much older men have more financial resources to outsource the second shift. Women who marry down in income or education are more likely to be able to negotiate more housework from their husbands. All of this sounds so sensible, I don't understand the uproar. Don't miss this critique of the Forbes opinion piece in Slate. The NY Times weighs in here about whether as many people read Forbes.com as Forbes claims. Maybe the provacative article was just a ploy to increase readership? 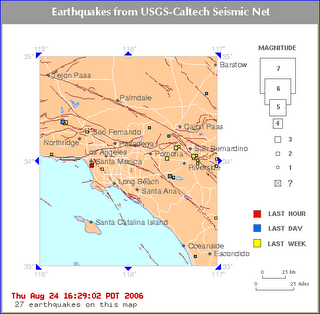 It felt like a stronger quake than it actually was. I was sitting quite close to the epicenter. You can read the details of the event here. I forgot to mention that three of my patterns are now for sale at the Slipt Stitch. Iris' modular poncho, the Aspen Leaf Laurel Scarf and the Fiber and Air Scarf patterns are all available for $3.99. The Slipt Stitch is at 421 Main Street in El Segundo (cross street Holly). (310) 322-6793 The store is open T-Sa. 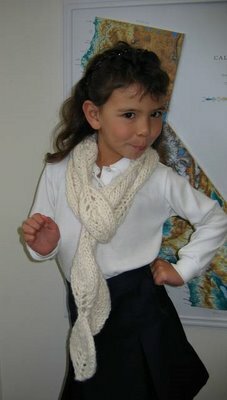 Patricia runs the Slipt Stitch, her husband runs the larger shop in Santa Monica, Yarns, Etc. If you call first, she can bring anything that is in the SM store to ES the next business day. She is also taking names of people who are interested in learning how to handpaint yarns. If there are enough people, I can teach a class there in the fall. Alternatively, you can leave a comment here with your emailATwhateverDOTwhatever to express interest in a class. The Basalt Tank is still a work in progress. I took it in to show Patricia, the owner of my LYS (the Slipt Stitch in El Segundo). 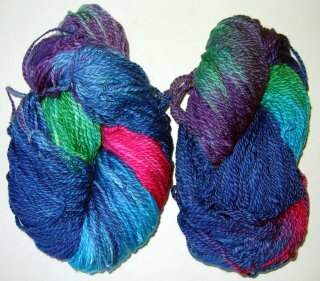 She suggested that I buy another skein of the purple cotton fleece and switch to the new dye lot right when I changed from stockinette to garter stitch. 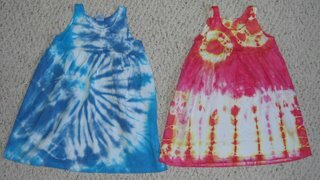 Sure enough, the slight difference in dye lots was not noticeable at all. I am really getting sick of this tank. I am itching to start something new and fresh that I won't have to fight with. Like Mardel, I am really taken with nearly all the sweaters in the Gray's Anatomy feature in the Fall 2006 Vogue Knitting Magazine. 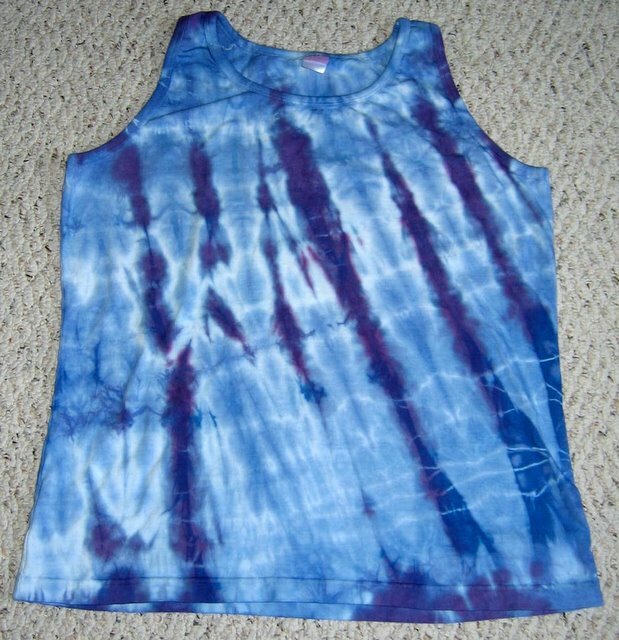 The only one that I don't want to make is the vest/wrap thingy. I love the cabled texture of this one. I would omit the big collar and foldback cuffs. I already bought yarn in two different shades of grey merino for the cardigan by Norah Gaughan. I intend to use the lighter grey for the scarf collar and the darker grey for the body. I also like the unique topology of this one. 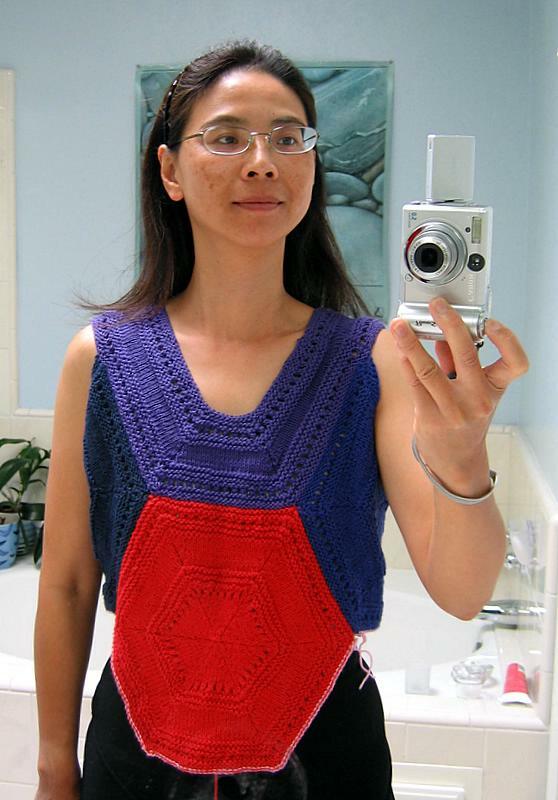 I worry that the front will make the sweater too warm for LA climate. I have a nice grey flowered chiffon that I could use instead of the cabled section. OTOH, maybe I can use the two tones of grey to do something interesting with the front of this sweater. Use one color for the LF and one of the cable sections and the other color for the RF and second cable section. The plaited cable would really pop. In high school, I made a sweater out of 4 different colors of Bernat Berella 4 with interlocking cables in contrasting colors. I loved the way it looked, but the turtleneck was way too warm for Berkeley weather. 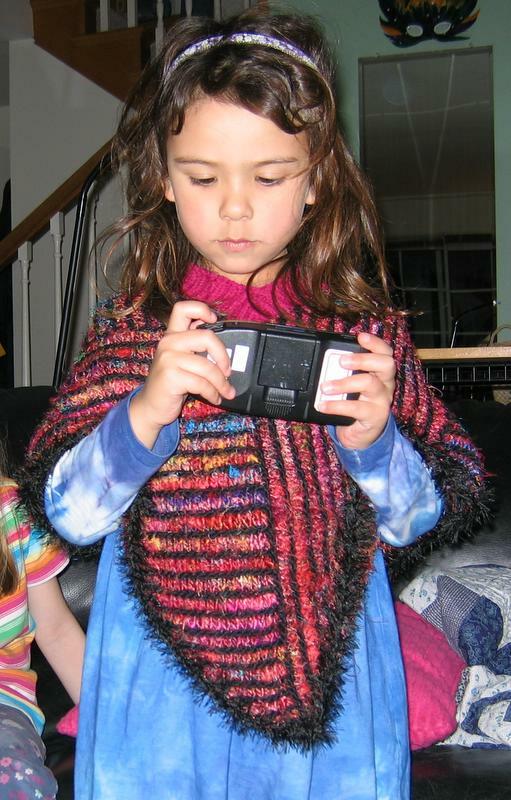 I lost the pattern but would like to make the sweater again. If anyone has it out in internet-land, could you email me? I started out the year with 4 UFOs and finished three of them. Adding the Basalt Tank, I have 2 UFOs. One of them doesn't even qualify as a WIP because I haven't knit one stitch on it since setting foot in Italy, much less the USA. If I painted the yarn for a project, but haven't cast on yet, does that count as another UFO? Taking a cue from NASA naming conventions, I will call this YarnEx. I swatched it, starting with size 7 needles and switching to 6. 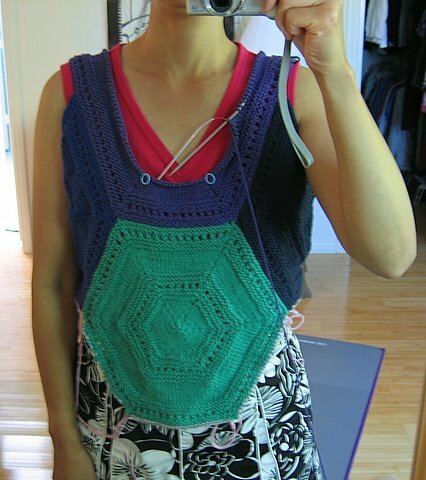 I usually need to go down one size when knitting back and forth instead of in the round. I shouldn't cast on for another sweater until I finish the Basalt Tank. But I really am itching to see how the colors will interact when I use it in the round. 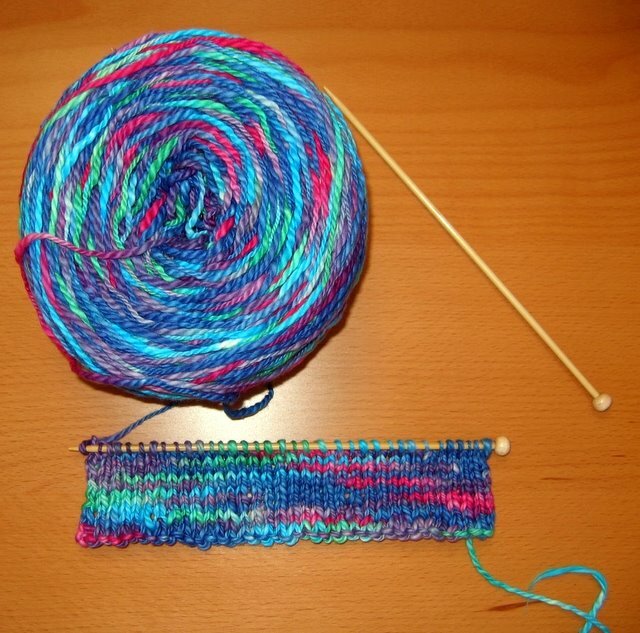 The swatch shown above has 1/4 of the stitches needed for the Model des Monats I chose. 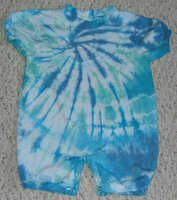 Click here to see how I painted the yarn. I have 3 reports to read before a meeting on Friday so I shouldn't even be blogging. I have real work to do. But, the reports are about how satellites measure the temperature in the upper atmosphere and that got me thinking about my personal responsibility for the temperature up there. 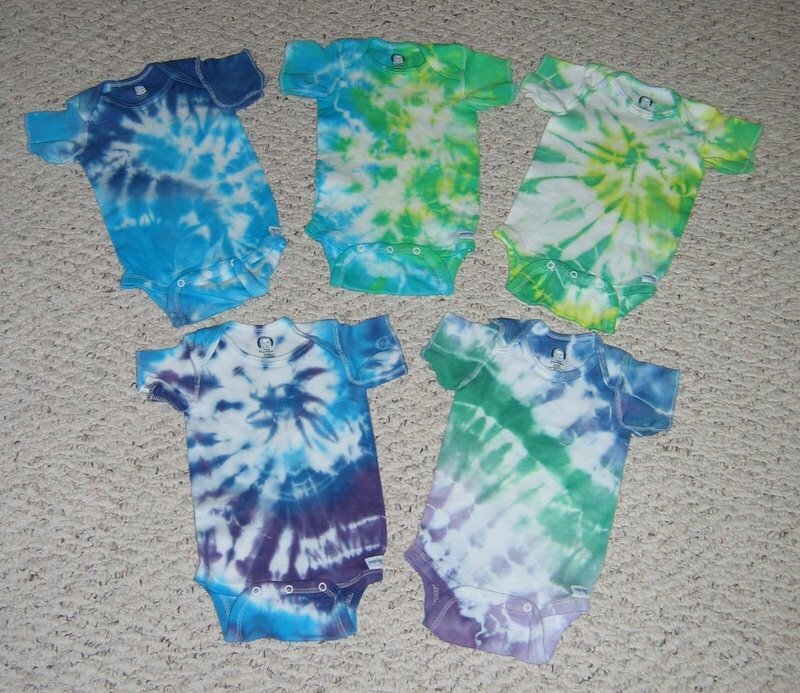 Today, I went to the post office and sent the packages of tie-dye to their respective new owners via Parcel Post. I didn't use air mail, FedEx, or any other air express package service. It will be a little bit slower. However, if they needed to get there earlier, then I should have sent them earlier. They are going the slower surface route because it takes less energy to ship them that way. These packages will not be on jet aircraft making contrails. Contrails are aircraft-generated cirrus clouds which in turn seed yet more cirrus clouds. Satellite imagery of the earth in the 3 days after September 11, 2001 show just how much jet travel has changed the earth's cloud cover and radiation budget (fancy words for heat and energy in and out). See this NOVA story for a synopsis. See this science news story for a more technical discussion. Cirrus clouds do not reflect as much sunlight back out to space as thicker types of clouds. However, they trap heat at night. A major cause for the increasing deadliness of heat waves is that the earth is not cooling as much at night as it did 40 years ago. Nightime temperatures are increasing even faster than daytime temperatures, partly because of the global increase in cirrus clouds. You can blame the urban heat island effect (huge amounts of concrete) and decreasing urban tree cover (urban trees are dying) and lots of other stuff. But there is no doubt that jet contrails are a major culprit. I do travel by jet for work quite a bit more than the average working mother. Our family also makes about one trip by jet for pleasure every year. I am not ready to give up our annual vacation. But I do ask myself if each business trip is truly necessary. This is beneficial for family harmony as well. Delivery trucks also use up fossil fuels and cause air pollution. By utilizing a service that goes to almost every home, 6 days a week anyways, we use our resources more sparingly. Even DHL Express uses USPS for their last mile delivery! I write about energy efficiency and global warming frequently. Click here to read a representative sample. I also write about the impact of my work and business travel on home life. Click here for an overview. 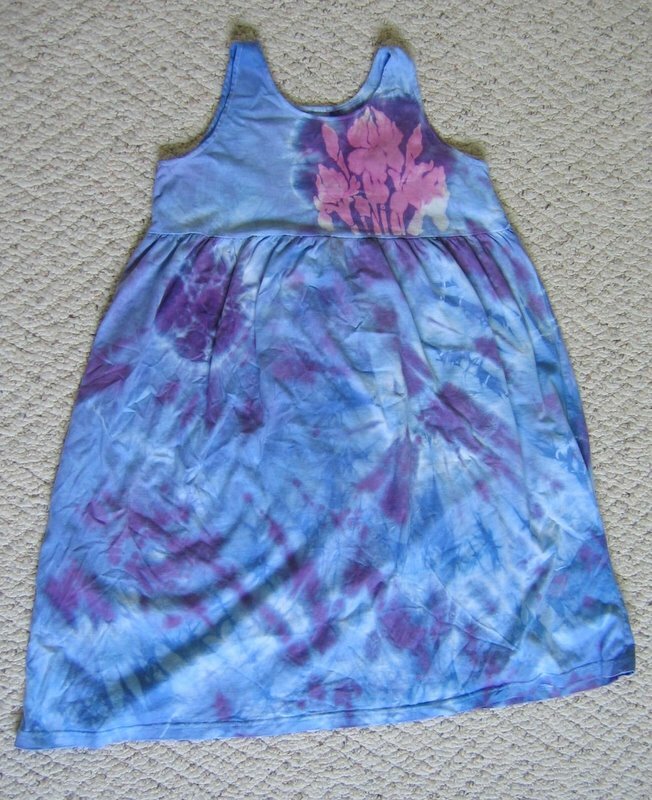 This last dress came out too dark in the upper left bodice area so Iris and I lightened it with a stencil and some dishwashing gel used as a discharge paste. We are quite happy with the result. 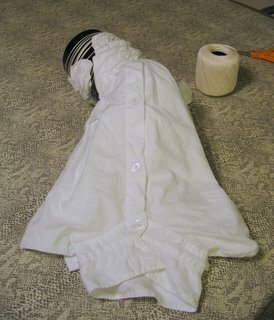 I just noticed that Dharma has instructions for a similiar Shibori project. I used crochet cotton which is a bit thicker than the dental floss that they used. They demonstrate one particularly effective techique. After you have painted the color on, lightly brush a contrasting color on the surface of some areas. It creates a sheer wash with very distinct patterning. 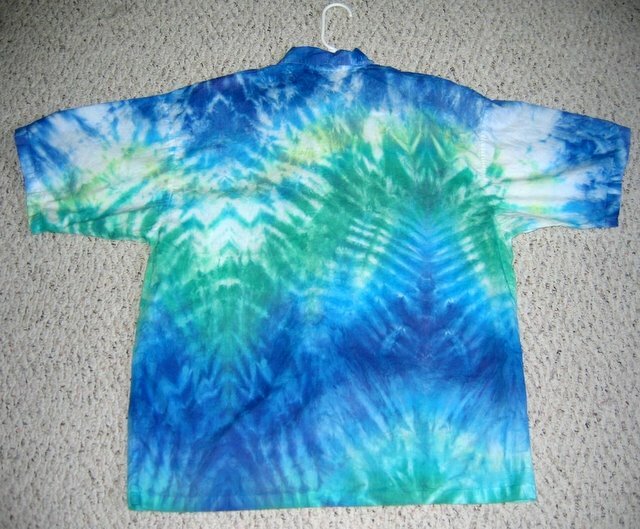 You can see the effect in the bottom section of the shirt where I washed a bit of sapphire blue on top of the turquoise blue. I feel a digression coming on. 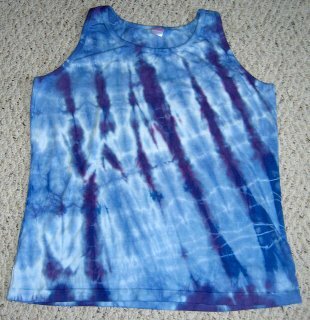 While taking a shibori workshop from Joy-Lily, I made the error of referring to what we were doing as tie-dyeing. She promptly told me that we were practicing Shibori, not tie-dyeing. I asked her what the difference between the two was. She said that tie-dye is something cheap you find at a crafts sale. We were learning an art. 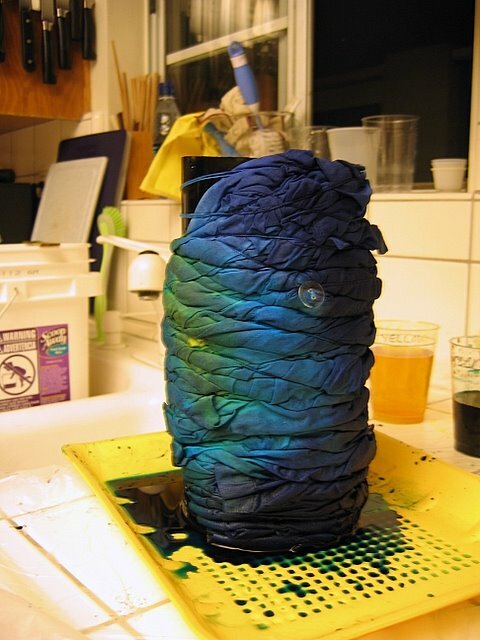 I am reading Yoshiko Wada's definitive book about Shibori which is worth every penny for all that I am learning from it. Wada also make a point that Shibori is a much more than tie-dye. She says that Shibori represents a whole genre of techniques that includes much more than tying. I stand corrected. This whole distinction reminds me of the time an older gentleman where Maribeth and I work referred to me as a girl. He recoiled in mock horror and said, "We are not supposed to call you that anymore. Nowadays, you are called women." I replied without missing a beat, "I don't care what you call me as long as you pay me like a man." He grinned and said, "You're all right." Rinsing did not take as long as I feared. I will post pictures of a knitted swatch when I finish the Basalt Tank (very soon, I hope). 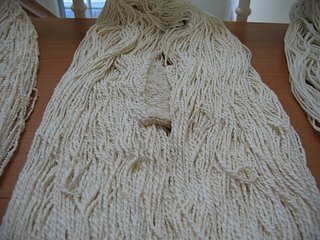 Click here to see undyed yarns and here and here to see the finished yarn. VW brought the rabbit back to the US market. Read Dan Neil's review of it here. As usual, he was amusing. 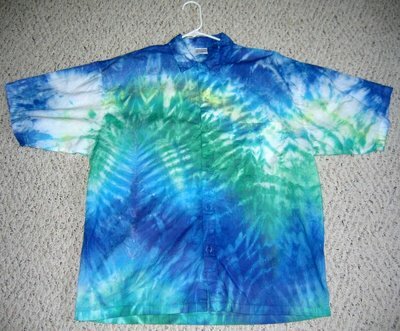 Yeah, I drove a rabbit around Berkeley and SF 20 years ago, wearing tie-dye no doubt. The real shocker comes at the end when he gave his actual gas mileage. The rabbit I drove got 40 miles to the gallon while he got 25% less than the EPA rating of 22/30. Even accounting for the difference between diesel and gasoline engines, the new rabbit's mpg is a disgrace. My humongous Sienna minivan does better than that even though it is over 1000 pounds heavier and has more horsepower. Is VW purposely trying to make their cars consume more gasoline? I read that, at a shareholder meeting, the head of VW bragged that VW had nothing to fear from government regulations on gas mileage. If necessary, VW could improve their fleet gas mileage 20% with merely software changes. Mark joked that the Europeans were engaging in economic warfare by getting us to waste energy on cars instead of putting it into production of goods that compete with theirs. I think that Americans don't need any help wasting energy and getting out of the production business. I think that the European and the American car manufacturers are telling us to buy Japanese cars. I have shown in a previous post how Mark and Iris get around by bike. 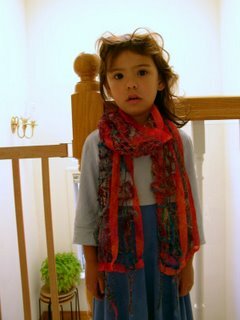 Iris sometimes tells me not to pick her up at school because she doesn't want to pollute and waste energy. I told her that I used to ride a bike everywhere, when I was healthier. She asked if she had ever known me when I was healthy. I had to tell her no. I was so happy when we were able to ride together like that on the Boulder Creek path. Thanks, Pete and Celeste, for helping to make it possible. We are going to try it around home now that I am getting stronger again. I got 2 packages from Dharma today. They are, in left to right order, Monte Cristo (pima cotton), Inca Cotton (organic cotton), and Andee (50% alpaca/50% wool). 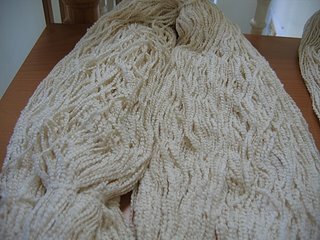 I had previously ordered the Andee and Inca cotton before and thought they were soft, but the Monte Cristo is like a fluffy cloud. I don't know how I will knit it. It is so soft and light, it feels like it will float away. 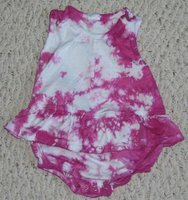 so I could dye my own handpaint a la the featured project on Dharma's main page. 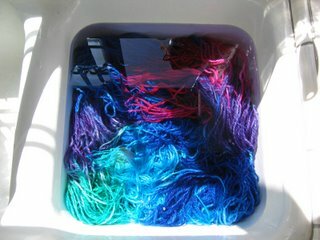 I have never used acid dyes before (if you don't count dyeing eggs, cake frosting or kool-aid dyeing hair and yarn). My sister says it is really easy so I hope she's right. Should I use my crockpot or my dishwasher for steam setting? I can use my trusty old fiber reactive dyes on the cottons. But, I like the cottons as they are. 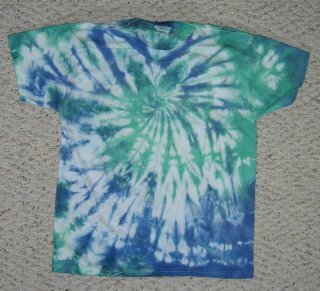 I was thinking the organic cotton would look good as the Modell des Monats from June 2004. I can't get enough of the designs in Knitting Nature. The pima cotton may end up as the shell tank. If I did dye it, what color should I try? A shell pink? I have returned to the Basalt Tank after a hiatus. I wanted to make the shoulder straps wider and toyed with different ideas. I hadn't counted on running out of the purple color so soon. I could rip back and start the stockinette section earlier, like the inside portion, and then finish with another row of lace (yo, k2tog) before another band of garter stitch. Or, I could just use up the rest of the purple and join in some black yarn to make a second garter, lace, garter band. That would make it a Basalt Shell instead of a Basalt Tank. Don't be shy, leave a comment with your suggestions. and here is the red side. It is reversible! I want to be let alone. Iris and Mark went to the movies yesterday. I couldn't resist taking a picture before they left. When she slipped on her jacket and sunglasses, there was something so adorably Greta Garbo about her look. I really shouldn't brag that the temperature near LA was cool enough to warrant wearing a jacket. When the sea breeze kicked in, it was positively chilly-ish. The look would have been more impressive if she wasn't wearing half her fruit salad on the front of her shirt. The shirt and the skirt are recycled clothes (in a fashion). I bought a remnant of the pink skirt fabric from SAS fabrics on the corner of 135th and Hawthorne Blvd. in Lawndale. They sell leftovers from the clothing manufacturers by the pound. The pink remnant was just large enough to make mommy and me skirts. I topped it with mommy and me lace shells in two pink shades of the now extinct Cotton Ease yarn. I will dig up a picture and post that later. Why couldn't she have just let me buy a bunch of $4 t-shirts at Old Navy, made by children for children? Oh, it was because I told her about how children in other countries are used like slaves to make rugs, shoes and clothes for us. 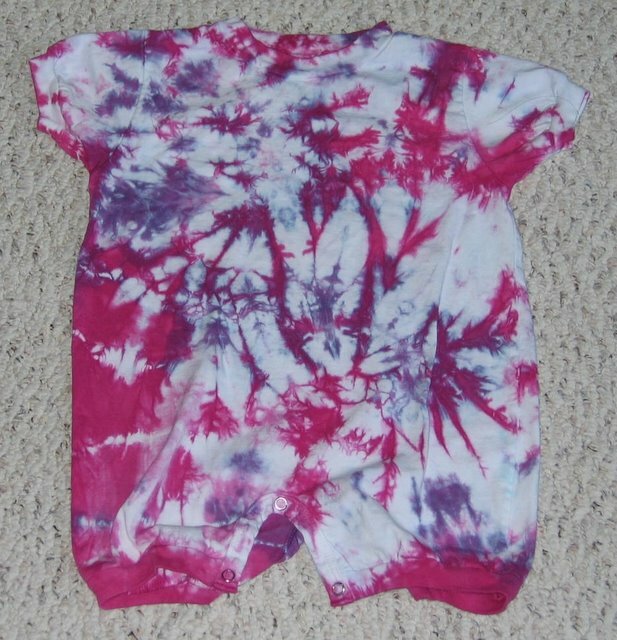 (I am not implying that those particular t-shirts were made by child and/or slave labor. In fact, I read that Gap was credibly trying to clean up their labor act in the face of a consumer boycott. I am just saying that it is hard for me, a consumer, to tell what kind of conditions under which an item is manufactured. The only clear-cut way to avoid buying into child/slave labor would be not to buy anything. That would be extremely difficult to do.) Back to the discussion about refashioning clothes. Finally, I felt better and tacked the first shirt, using little bits of interlock or stretch jersey (bought at SAS) from my stash. Once I had the system down, the other 5 went very quickly. She loves the shirts. So that I wouldn't be a slave (working without pay), she emptied her piggy bank and paid me for my labor. I was moved. I laughed out loud when I read this article about new baby foods. 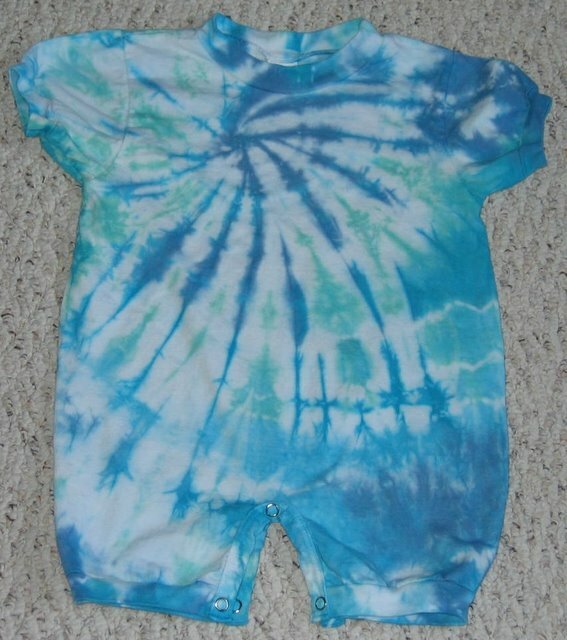 I like the concept of exposing babies to a wide variety of tastes and feeding them with fresh and organic foods. But I question the extremes that the parents in the article go to. It just reeked of one upsmanship. Kinda like those Boulder parents that broadcast that their children have eaten only organic since birth. Why don't the folks in the article just puree some fresh local organic veggies themselves? Why Fedex frozen organic gourmet food from across the country in vacuum sealed baggies? Is such a huge energy expenditure justifiable? Maybe it is the same set that flies corporate jets to get to their second or third or fourth vacation home. Mothers in the "old country", whichever country that means to you, just did what came naturally. They fed babies the same stuff they ate. My mom cooked foods until very soft and mushed them up for me. To this day, a steaming bowl of congee still means love to me. Even though I have been ill since she was born, I still fed Iris with a variety of home-prepared foods that cost little in terms of time or money. Here's how. This one is obvious. Breastmilk is essentially free and melts those pregnancy pounds away. I breastfed for 18 months, enough to see her through the first two flu seasons. I also ate lots of strongly flavored foods, just to give the breastmilk extra oomph. I thank my lactation consultant for urging me to do this in order to expose Iris to strong food flavors early. This works better (cheaper) if you have a Trader Joe's near you. I microwaved frozen organic veggies or prepared bagged produce with a little bit of water. Then I pureed them in the blender with just enough water so that the blender blades would work and froze the puree in ice cube trays. In season, I sometimes did this with fresh veggies. But frozen veggies can be more nutritious than veggies sitting in my fridge for a week or two. Try peas, carrots, squash, edamame, zucchini and broccoli. I boiled potatoes, pureed them, and froze them in ice cube trays also. I made rice porridge (aka congee aka wet rice) and froze them in ice cube trays. Why buy those little packs of applesauce when you can buy a big jar and spoon out into a bowl just what the child will eat in one sitting? When eating chicken, set aside some small cubes for the baby to gum. Save some in the fridge for later. Soft tofu cubes are also good for gumming. Don't forget how easy it is to mash a banana. You can use a knife to slice through the whole banana, peel and all, and then store the chunks in a ziploc bag at room temperature. They won't turn mushy and brown if you squeeze the air out of the bag. I put each batch of baby food in a ziploc and wrote the date on the outside. When Iris was hungry, I plopped a couple of cubes of different foods into her bowl, microwaved it a bit, tested the temperature, and fed her. This sounds alot more labor intensive than it was. It literally takes only a few minutes of active prep time to microwave a bag of frozen peas, blend it up and pour it into ice cube trays. It was a helluva cheaper and tastier than jarred foods. We always had trouble using up the whole jar before it went bad or felt guilty about force feeding her the same exact menu until the jar was empty. A single cube is less commitment. We bought little plastic containers and slipped frozen cubes of food in them when we went on outings. The food was the ice pack! If you find another like-minded mom, you can trade the cubed foods in your freezer. Lazy, cheapskate moms of the world, unite! 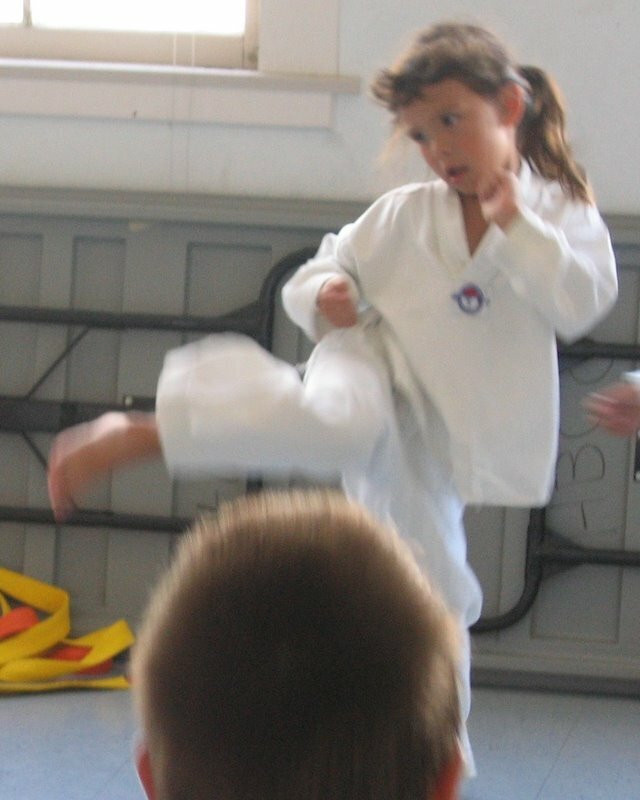 She had trouble with a new kick so she stayed after class to work on it. That's one good reason to schlepp her to HBCC. There are simply too many kids at the school-based lessons for her to get individual attention when she needs it. 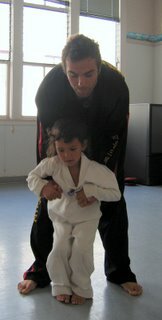 Although most of the other students pay by the session, our schedule is too erratic for that. He allows us to pay a la carte for each lesson. Anton reminded everyone that he will be on vacation for 3 weeks. Today's was the last Tuesday class until September 5. There will be one more Monday class next week, August 7. The normal HBCC class schedule resumes after Labor Day. Anton had trouble explaining a concept to the kids today; he is not a native english speaker. Iris got it immediately and piped up that it was like the words to that song. He asked what song. She said, "never take the path of least resistance." He said that will be the Dragon Club motto.